The 1965 Opel Experimental GT and the 1966 Vauxhall XVR were the first true concept vehicles to appear from the design houses of a European manufacturer. Both of these innovative cars were thoroughly modern with dynamic sculptural forms. Inspired by these groundbreaking vehicles, Vauxhall has designed the GT Concept which will be a template for future sports cars. A key innovation of the GT Concept is its large doors with integrated side windows that show a seamless transition from glass to painted surfaces. Both driver and front passenger gain access to the spacious interior after pressing a touchpad for the electric doors. The doors open into the front arches, using a space-saving and patented mounting that allows a large opening angle for tight parking spaces in urban areas. Two cameras mounted behind the wheel arches offer enhanced visibility, especially in city driving. They transmit their images to two monitors on the left- and right-hand side of the cabin, rendering external mirrors obsolete. The windshield flows into a glass panorama roof, affording occupants a similar experience to that of a targa-topped car. The GT Concept’s front-mid engine configuration keeps the car’s center of gravity low and central for excellent dynamics. Beneath its long hood is a powerful 1.0-liter, three-cylinder turbocharged engine. Developing 145 PS and maximum torque of 205 Nm, the engine delivers drive to the rear wheels, via a six-speed sequential transmission operated by steering-wheel-mounted paddle shift. The GT Concept accelerates from 0-62 mph in less than eight seconds and on to a maximum speed of 134 mph. Another unique feature of the GT Concept is its integrated headlamp/indicator units. Using ultra-modern projection technology, the lights have a three-dimensional beam which allows glare-free high-beam driving. The design of the lights is completed by the three-dimensional design of the tail lamps. You will notice that red is a prominent accent color in the car’s design. 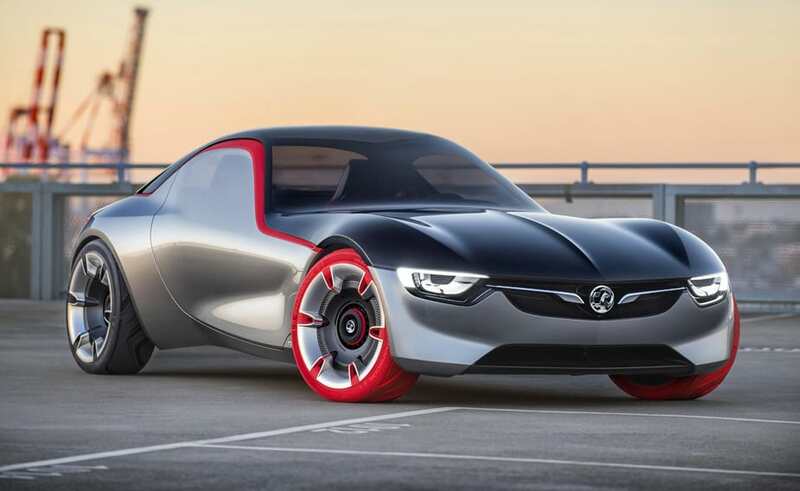 The Vauxhall GT Concept is divided horizontally by a red signature line and distinctive red tires – mounted on rims with a ‘roller-skate’ design – reference the iconic Opel Motoclub 500 motorbike from the 1920s which sported red rubber.